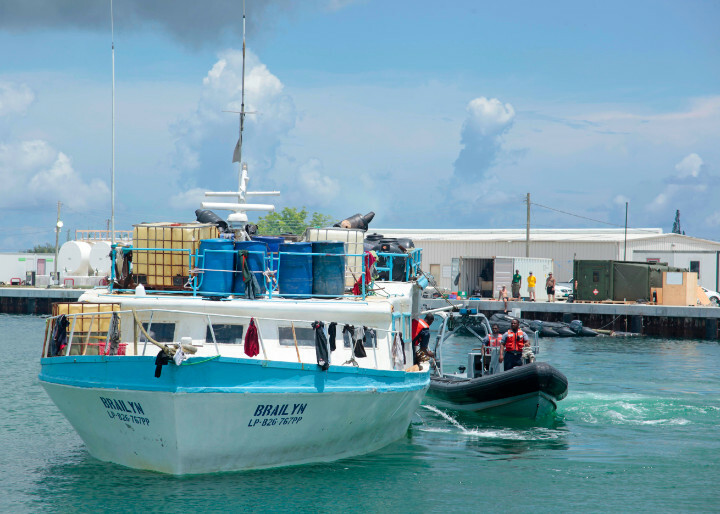 Coral Harbour Base,(RBDF): Her Majesty's Bahamian Ship (HMBS) Durward Knowles apprehended a Dominican fishing vessel for poaching in Bahamian waters on Saturday morning. While on routine patrol in the southern Bahamas, HMBS Durward Knowles, under the command of Lieutenant Commander Omarv Saunders apprehended a 50-ft Dominican fishing vessel on the Great Bahama Bank. On board at the time were 4 Dominican fishermen, along with a quantity of scaled fish. HMBS Durward Knowles is continuing its search for additional crewmembers of the Dominican vessel who left the area aboard several skiffs. The arrest comes on the heel of the apprehension of two drug suspects, along with the discovery of 168 pounds of marijuana with an estimated street value of $168,000 on 10 June 2018 by Defence Force Marines stationed at the Exuma Cays Land and Sea Park, along with the Park Warden. The suspects were charged before the courts after they and the contraband were handed over to Police. The matter went before the magistrate court on Thursday, 14 June 2018 where the suspects pleaded not guilty and were remanded to the Bahamas Department of Correctional Services. The case is currently ongoing. On September 18th of last year, the Defence Force patrol vessel, HMBS Durward Knowles apprehended 6 Dominican poachers aboard three skiffs in the area of Cay Santo Domingo. The Dominicans were sentenced for engaging in foreign fishing within the Exclusive Economic Zone of The Bahamas and each were sentenced to 18 months in prison. They were also charged with possession of prohibited apparatus for fishing purposes and were sentenced to 6 months in prison at the Department of Correctional Services. The Dominicans in this latest incident were taken into custody and will be handed over to Police and officials at the Marine Resources Unit. The Commander Defence Force, Commodore Tellis Bethel, expresses gratitude for assistance received by the Defence Force from the local fishing community in its efforts to interdict poachers. He also commends the Commander Operations, Commander Clarence Dean, and his operations team on the success of this recent operation.